I have received a letter with a query about whether kibosh might be a borrowing from Hebrew. Both the Hebrew and the Yiddish hypotheses on kibosh are discussed in detail in the book by Gerald Cohen, Stephen Goranson, and Matthew Little on this intractable word (Routledge, 2018). The Hebrew origin of kibosh is quite unlikely. I may repeat what I have more than once said in this blog. Although, when a certain word sounds similar in two languages, the idea that there was a lender and a borrower is natural, but the main thing is to trace the way of the word from place to place. Were the people who popularized the English word London Jews? If so, where and when could they make it so widely known? The three authors provided enough material to make it probable that kibosh goes back to kurbash “lash.” With regard to the English word, the distant origin of kurbash is irrelevant. However, I have some suggestions in regard to the history and spread of kybosh in English. Nothing contradicts the idea that kurbash “lash,” once it came to be pronounced as kybash ~ kybosh, was associated with bosh “nonsense,” while the first syllable made people think of kerslap, kerplunk, kerfuffle, and the rest (we are dealing with an r-less dialect!). Perhaps without the help of folk etymology, this exotic word would not have survived. Surprisingly, the verb kybosh came also to mean “to make an object perfect.” Yet this development may not be unnatural. To kybosh meant “to put an end to something, to finish,” and finish is a double-edged word (compare something lacks finish, among others). Allegedly, Portland cement loved to be kyboshed. The evidence is slim, but tastes differ. 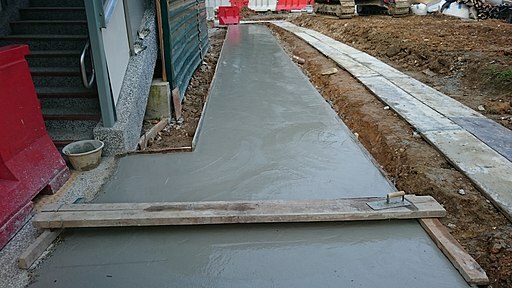 Image credit: Wet cement by ProjectManhattan. CC BY-SA 4.0 via Wikimedia Commons. In British school slang, kybosh once meant “nonsense, blarney” and “beating” (I’ll give him kybosh). “Beating” is quite in character, but why nonsense? Perhaps the confusion with bosh will suffice, but there may be another explanation. In the previous post, I mentioned several so-called monomaniacs, including Charles Mackay, the man who tried to derive hundreds of English words from Irish Gaelic. But I also said that, if someone offers a thick volume of nonsensical etymologies, he may in one or two cases, by sheer chance, hit the nail on the head. Naturally, Mackay derived kybosh from Irish. He wrote “Gaelic exclamation cia baois, pronounced as ci-baoish, means ‘what idle nonsense’ or ‘what indecency’.” We have no evidence that the Irish phrase ever reached England, let alone became popular there. But, if it did, it might reinforce the bosh idea. Perhaps the path of kybosh through British slang was not quite straight. The question was about the words mardy “a spoiled child” and wazzock “an idiot.” Their etymology is unknown, and my few remarks will be of little use. One of the problems with both is their amazingly late attestation. 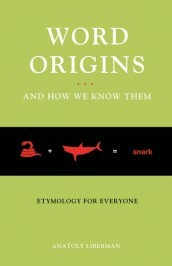 The OED online cites both. The earliest citation for mardy goes back to 1874. However, at that time the word had so little currency that it did not get into Joseph Wright’s English Dialect Dictionary, a wonderful work compiled at the end of the nineteenth and the very beginning of the twentieth century. Mard “petulant mood,” not recorded before 1998, is treated in the OED as a back formation from mardy, that is, mardy minus the suffix -y. Mar “to spoil a child” was known earlier. It looks like a specific sense of the verb mar “to spoil; disfigure.” However the derivation of mardy from the past participle marred does not look too convincing. Can we imagine nouns like starvedy, killedy, lovedy? Do we have any nouns with the suffix -y from past participles? Some intermediate steps in the history of mardy seem to be lost. Wazzock may be not so impenetrable, though it surfaced in texts only in 1976 (OED). In any case, ss often varies with zz. Wright has wassle ~ wazzle ~ wheezle. Also, wassock exists, the name of some pegs. Calling a stupid person a blockhead is common, and so is an association between an idiot and a piece of wood; –ock is of course a diminutive suffix (as in hillock and others). The Mistletoe. Was this plant Embla? Image credit: MistletoeInSilverBirch by Andrew Dunn. CC BY-SA 2.0 via Wikimedia Commons. In the post for October 10, I mentioned Askr and Embla, the names of the first human beings mentioned in a Scandinavian myth. Askr means “ash tree,” but Embla remains a mystery, because no tree name sounds like Embla. A good deal has been written on this couple. Yet the research dealt with the possible prehistory of Embla and sheds no light on the picture before us. 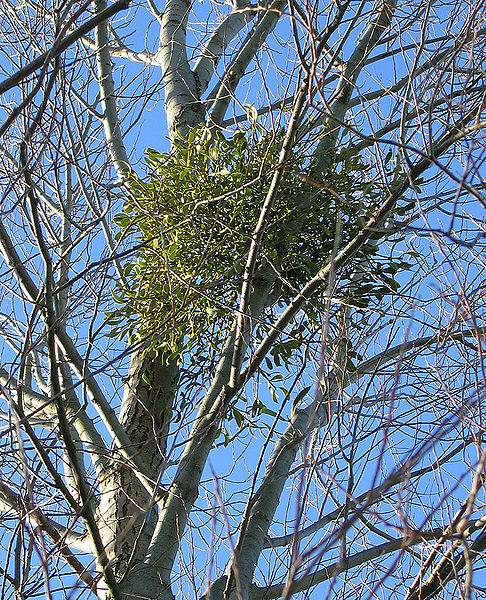 A comment on the post suggested in no uncertain terms that Embla is related to omela (stress on the second syllable), the Russian word for “mistletoe.” No doubt, b in Embla could be inserted between m and l. This is a common occurrence: compare the history of the English word nimble, whose root is nim– “to take.” Also, the form Emla did turn up in the past. The rest is more troublesome. One expects the second name to have made some sense to the myth makers and to those who heard it. They had no access to our dictionaries of Indo-European roots. The origin of omela has not been established. Perhaps Albanian ëmlë “sweet” (German Ampher “sorrel,” that is, “sour” [!] and Latin amārus “bitter”[!!]) is related, but there are other theories. For instance, there have been attempts to compare Embla with elm (so “little elm”?) and with Greek ámpelos “vine” (akin to Sanskrit āmras “mango tree”). All this is very interesting, but the main question remains: Did the medieval Scandinavians understand the name Embla? Apparently, they did not, for such a word did not exist. This makes our guesses uninspiring, though, to be sure, some old word may remain unknown to us. Finally, the mistletoe would be a strange candidate for Askr’s female companion. This parasite plant grows on trees, which it eventually destroys. It is remembered in Scandinavia only because, according to a famous myth, it killed the shining god Balder (the Celtic beliefs to which we owe the use of holly and mistletoe, and the old custom of kissing under the mistletoe, immortalized in The Pickwick Papers, is not connected with Askr, Embla, or Balder). The story is the result of a misunderstanding: the mistletoe must have replaced another plant in the original myth. Those interested in knowing how it happened will find a detailed discussion in my book In Prayer and Laughter… (the chapter on Baldr). Many thanks to Stephen Goranson for pointing to the alleged portraits of O. G. de Busbecq, none of which I risked reproducing, and for telling our correspondent where the posts on English kl– words can be found in this blog. One of the kl-words I discussed in my etymological dictionary was clover. Another correspondent wanted to know whether there might be a connection between the Germanic word and the words with a similar-sounding Hebrew root. Probably not. I say so, because clover seems to belong so very well with other kl-words, all of which refer to stickiness and are often clearly related to gl-words outside Germanic. Possibly, this is a picture of Ogier Ghiselin de Busbecq, featured in the previous post. He recorded some words of the language now called Crimean Gothic. 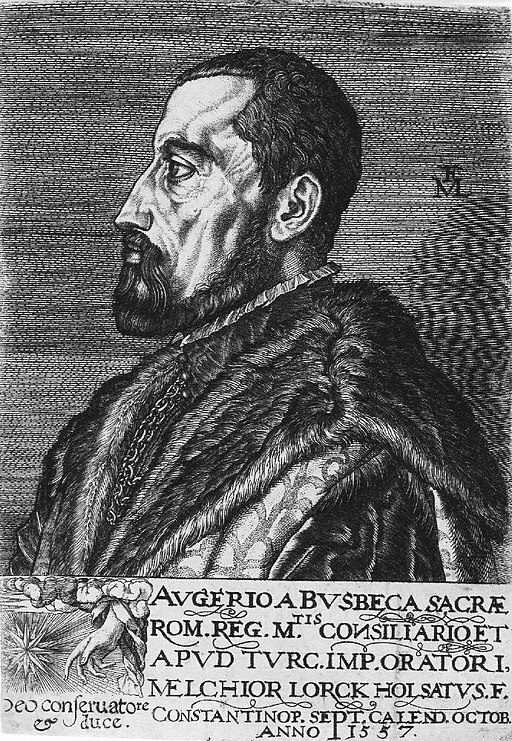 Image credit: Busbecq by Melchior Lorck. Public Domain via Wikimedia Commons. I left several remarks unanswered, because I have nothing to say about them, but I would be happy to read other people’s comments on them and, should there be a discussion, join it. As regards bride, I’ll return to it later. Featured image credit: Welcome Words Greeting by Tumisu. CC0 via Pixabay. The claimed memory of kibosh involving Portland cement is from 1901, about sixty years after the word kibosh is known in print. Anyone can check our book (Origin of Kibosh) for the early uses of the term and determine for themselves whether kibosh originally involved completing an artwork or administering a flogging. I heard ‘mard’ as an adjective, meaning soft, weak, nesh, prone to crying and fearful of hurt or anything negative, when I was a child in S Lancashire in the 1940s: ‘he’s proper mard, that kid’. ‘Mardy, mardy’ was what one kid was called by others. It was a kid’s diminutive. To my mind, ‘mard’ precedes mardy, as the adult formula. D. h. Lawrence uses the word in one of his novels. My contention for Lithuanian ãmalas ‘mistletoe’ and Russian omelà ‘id.’ is that their precursor properly meant ‘branchling’ vel sim., as derived from (or related to) the PIE word for ‘shoulder, branch’: *h₂om-es-, an old s-stem which was thematicized in different ways in the daughter languages, i.e. Latin umerus ‘shoulder’, Tocharian B āntse ‘branch, shoulder’ etc. (presumably also Gothic ans ‘wooden beam’ and Old Norse áss ‘beam, yard of a sail’). I follow De Vaan for the reconstruction. Moreover, in the poetic sense of ‘scion, offspring’, it might be the same word as the mysterious Germanic name element Amel-, Amal-, Emil- (cf. the Gothic Amal-dynasty and feminine forms such as Amala, Ambla, Amalia and Emilo [sic]). As for the deeper etymology: since words for ‘branch’ have been derived from verbs meaning ‘to cut’, like Middle Dutch telch ‘tree-branch’, Dutch telg ‘scion’ (cf. Old Norse telgja ‘to cut, carve’, Lithuanian dal̃gis ‘scythe’), a good candidate is *h₂em-, attested as the thematicized fientive *h₂m-eh₁- (listed as *h₂meh₁- ‘to mow’ in LIV²). One of several others derivations be *h₂om-ro-, i.e. Sanskrit amla-, ambla- ‘bitter’, Latin amārus ‘bitter’ (with suffix substitution) and (via Pre-Germanic *ambra- with epenthetic b), also Proto-Germanic *ampraz, i.e. Dutch amper ‘sour, bitter, harsh’, Old Norse apr ‘hard, sharp’. Following the suggestion that Em(b)la means ‘little elm’ and given the description of Askr and Embla as driftwood washing up from the sea, it is worth noting that both ash and elm make for good timber when it comes to seafaring ships. Hence Old Norse askr and Old English æsc could also denote ‘ship’, while askmaðr and æscman meant ‘seaman, pirate’. Elm wood in particular is highly resistant to salt water. With that in mind I have recently come to the conclusion that the precursor to Old Norse víkingr, Old English wícing and Old Frisian wītzing is most likely derived from an old word for ‘elm’ which is attested as Old English wíce, English wych elm and Low German wīke. This would also explain the Old Norse expression fara í víking – thus properly meaning ‘to fare in an elmling’.